Renzo Gracie's Manhattan Academy sits cozily in Midtown, only a block away from Madison Square Garden. True to the New York lifestyle, people are streaming in and out of the studio all day: Working men standing patiently outside the door at 6:30 am, colored belts in their briefcases as they wait to roll; Instructors switching on lights that another had switched off twenty minutes before, to prepare for a noon class or a private session; Children in their miniature gis leaving the academy in the afternoon as they hold their parents' hands; The sun setting while Muay Thai students wrap their hands as they wait for their practice to begin. The confines of the building alternate between a pulsing energy or meditative quiet. Running seems like it would be almost the opposite of what Brazilian JiuJitsu or Muay Thai are. The latter are combat sports, primarily accessible if you have someone to teach you or a place to go to learn. Muay Thai is fun, with its jabs and crosses, knee strikes and elbows to the head. Running is what your gym teacher made you do before you started your P.E. class. JiuJitsu has you rolling on mats and attempting to get triangle chokes. Students run before class to condition; but once the warm up is over, they are on the ground, following their coach's instructions. What about those who actually like running? Who do it for a benefit beyond their respective sport, for reasons like having time to think, a way to relax...or even, for fun? What's in the heads of those people, especially the women who come to the academy throughout the day? What about the sport of running fits in with their world at Renzo's?For one activity, you need a good pair of shoes; for the other, all you've got is bare feet. Michelle is pretty much a badass. She just competed for Team Renzo in a Muay Thai fight in February, and can trade punches with the best of them. Running has helped her build a solid foundation of cardio. Michelle's fight camps consisted of alternating between sprints and sparring. Her head was never hung in fatigue at the end of a session; rather, she would have her arms raised high up in a symbol of victory. Mentally, running trained her to push herself and continue even when things have become uncomfortable. Pain and discomfort from running (or a fight camp) are only temporary feelings. Running was used as an aid in learning how to breathe properly under physical stress. Michelle would push herself to run until she couldn't breathe, take a recovery minute to use her inhaler, and then run again--strengthening her lungs and building her athleticism. This would help her later when she completed an Ultra Spartan: a 12 mile race with 30 or so obstacles. Michelle trained for this endevaor by running on a beach path between Santa Monica and Venice, with the gorgeous Southern California sunsets keeping her company. Her weekend mornings were spent at Muscle Beach climbing the ropes and swinging on rings. She supplemented her training by going to a parkour gym to "basically learn how to fly". By the time she made it to the race, she beat out many of the LAPD and military veterans who encouraged her to sign up, holding good on her promise that they wouldn't be able to match her. Even though she is a hard worker, Michelle does have boundaries for smart training. To avoid overtraining during fight camp, she doesn't run beyond the sprints. Her nutrition is specific to her activity for the day, whether it is for competition or regular practice. Michelle ensures that she doesn't consume processed foods, other than supplements for vitamins in which she is deficient. Also, she focuses on getting the proper nutritionally-dense fuel for each training session, and replenishing it immediately afterwards. A heart rate monitor gives her the details of her work rate, so that she can eat accordingly. Leafy greens play a large part, as well as a rainbow of fruits and vegetables. Yams, black rice, pasteur-raised meats, and wild fish give her an edge. She brews kombucha and bone broth to boost her immune system, maintain gut health, and reduce inflammation. In Michelle's eyes, a recreational athlete's commitment to practice, training, and health will play a incredibly significant role in performance than anything else. The mental aspect is what is most parallel for Michelle in running and training martial arts. The same principles of consistency and nutrition apply, but in both these activities it is only the athlete who can carry it out. Coaches and a team can be supportive, but its ultimately it is up to the student to actually execute. She finds it important to remain calm in the midst of both sports, despite their physical demands. Relaxing has many benefits: one's mind is more aware, allowing a person to see what is really occurring and react quicker. Tension isn't unnecessarily held in muscles that aren't being used and movement become much more fluid and efficient. Michelle emphasizes that mental toughness is crucial as it's easy to find the same reasons to not attend practice or to go for a run. By choosing to not use those excuses as a reason skip training, a huge part of character is revealed and greater self knowledge can be attained. Michelle's best advice to runners? "Health always comes first! Sleeping and eating properly is a priority. Having that in place will only enable you to run your best." You can follow along with Michelle at @hellomissmichelle on Instagram. Isang carries a variety of titles: licensed massage therapist, running coach, Muay Thai athlete, fellow Inland Empirer. Her Instagram is a wealth of motivation: funny quotes about coffee on Monday mornings sets the tone for the week, interspersed with phrases about believing in one's self and images of her rocking red shin guards. She's the kind of person you want to go to when you're having a bad day, as well as someone who is genuinely delighted by any kind of good news. Originally from Southern California, Isang brings her West Coast charm to every class and leaves teammates with a smile when the session's over. Running for Isang is her "peace of mind" place. It is how she feels alive and free. Once she starts a trail, she is no longer confined by work assignments or household chores. That time is solely to unwind and meditate into focus. Running gives her a sense of balance and a starting point. She has the opportunity to be grounded in her body and understand what she needs to be aware of for her next training routine; if there is an injury that should be treated with care, a muscle that is feeling stronger, or a mental block that needs to be worked out. The very act of running is something so simple; it is almost meditative and allows her to mentally prepare for Muay Thai training. Focusing on putting one foot in front of the other while maintaining an even breath allows Isang to declutter her mind and be aware of the task at hand. This awareness follows Isang's training performance in practice and she is able to remain calm, even if there's a glove coming up under her chin or a kick flying towards her head. Isang emphasizes on prioritizing specific training to be able to accomplish her goals. If she knows she is going to attend Muay Thai practice, she ensures that she modifies her mileage accordingly. She knows that the only breaks she is given during class are when she is watching a demonstration or calisthenics; so Isang makes sure she is well-rested prior to attending. As nutrition goes hand in hand with recovery and training, she consumes simple nutrient dense food when she is preparing for a race. Sugary and heavy meals are nearly eliminated, and kale smoothies and steaks appear in her diet more often. While she started running in elementary school to beat boys in blacktop races, one of her running highlights occurred in high school when she was participating in Track and Field. The event was the 300 meter hurdles and her opponents were national champion level. While she was not known just yet for her hurdling skills, Isang was able to beat all of them. This helped her to realize that she could accomplish so much with her dedication and talent in running. Isang runs about 3-4 times a week in between Muay Thai practice and strength-training. Martial arts teaches her techniques to defend herself and the value of consistency. Running is the way she unwinds from stress and refocuses on her goals. With both, she is an unstoppable athlete. Isang's best advice: "Don't waste time, live and love fully in the moment for you never know when next you'll get a chance to feel as alive or free!" Cat-eyes and a wide smile define Kristen. Kristen was one of the very first people I trained with at the academy, and I will never forget how nice she was (or as I would learn later on, how dangerous her kicks are). She was there for my first race and helped me to warm up, stretch, and relax. The awesome person that she is, Kristen recently ran the United Half-Marathon in New York City on behalf of the American Jewish World Service. The 13.1 mile long race was on Sunday and she still showed up the next day to practice Muay Thai at the academy (instead of resting her ankles with frozen bags of broccoli like some of us do). Running helps Kristen in many ways. She resolves emotional matters physically, meaning that if she feels sad, hurt, or angry, she goes for a run. Generally afterwards, she feels better. It also gives her an edge in other sports. The cardiovascular fitness and mental game that comes into play when one runs regularly is valuable in all other physical endeavors. Since she is both a New Yorker and a hard worker, Kristen pushes herself and dedicates most of her time to training despite her busy schedule. A typical week includes getting in repeats, tempo runs, long runs, weight training, Muay Thai, yoga sessions and the occasional dance class. Her day starts at 4:30 am with a run and weight training, before the first Muay Thai class starts at 7 am. The morning practice is just the first part of her routine; 12 hours later she's back for a double evening session. Some could do that maybe once a week, at most. However, this is just Kristen's weekday schedule. It can be difficult to get up the next morning, especially after training for two hours the right before. Additionally, she works full time during the day, sandwiched between her training sessions. Exhausting, but definitely rewarding. Kristen makes sure to fuel herself properly and consistently. She doesn't eat meat or dairy, and instead enjoys fruits, nuts, vegetables, and legumes/grains. Green juice is her companion through the day and she is hyper-aware of her daily consumption. Her preparation starts on Sunday, when she makes all her food and snacks for the week to take to work. Like many, she has a pretty wicked sweet tooth but she manages to tone it down if a race is impending. Despite what you're reading, Kristen is human and needs the occasional energy boost after a long day at work and before evening Muay Thai, so she relies on Honey Stinger® chews (get yours here: http://www.honeystinger.com/organic-energy-chews.html). 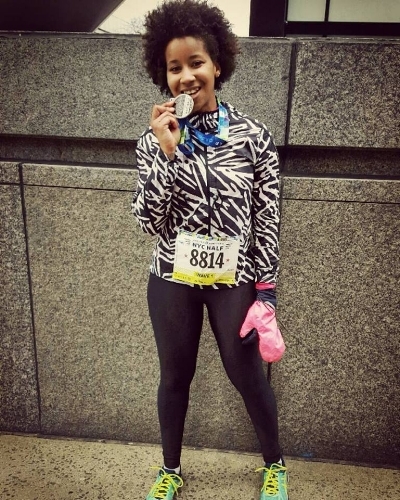 The New York City Marathon is nothing new to Kristen, but her first time was the most memorable. She worked very hard to qualify, and when she finally got to the starting on the Verrazano bridge with New York, New York by Frank Sinatra playing over the loud speakers, she was moved to tears. The atmosphere at the marathon start is electric with the sheer amount of people experiencing adrenaline rushes and surges of anticipation. She recalls all the love she experienced running through the city that day, with strangers, friends, and family alike cheering her own. She felt superhuman after running for so long and realized she could do literally anything. In her eyes, nothing tops the New York City Marathon. Despite her many commitments, Kristen makes sure to run as much as possible. Every week includes a long run, 800 meter sprints, and a tempo run. Kristen views running and Muay Thai as the same: both include discipline, love, hard work, sacrifice, fun, happiness, and reward. Kristen wants all runners "to be thankful for every run... not everyone is so lucky as to be a runner. And be kind to yourself... take rest days... especially when you are injured... they are important!" Faye is a purple belt in Brazilian JiuJitsu and teaches children at a well-known Mixed Martial Arts studio in the city. This Seattleite rises early to start training JiuJitsu and will still end the day with a double practice. Don't let her petite frame fool you--she's a dangerous weapon, but the kind who will hug her opponent afterwards and give them compliments on their technique. She competes regularly in the Abu Dhabi trials and the International Brazilian JiuJitsu Federation tournaments. Running serves a variety of purposes for Faye: an opportunity to clear her head, challenge herself, stay healthy, or even as entertainment. Each run is significant to her personal development, as she finds herself becoming mentally stronger by the end of every venture. Faye is the kind of person who will set a new goal as soon as the older one is crushed: once she got her purple belt, her eyes were set on brown; and the same goes for her running. Even if she did her best, she knows that she can do even better the next time. It excites Faye to constantly test the limits of her physicality and the results that come with it. She views running and JiuJitsu as movement meditation: where it is all for yourself and catered to yourself. Faye runs long and short distances as they are both beneficial to maintaining a healthy heart. It also helps her to remain strong and focused, especially when she goes to train. While JiuJitsu is something she'd rather do over anything (maybe even sleeping and eating), running is how she finds calm and meditate outside of what is occurring in the rest of her world. Considering that Faye is an elite athlete, she ensures that she has the best diet she can possibly create for herself. She runs and trains for long durations of time, and needs to make sure that she has enough energy to be successful in both. Faye balances what she needs to consume for fuel with what she craves, and in this way she never feels deprived. She encourages others to enjoy their food as well make good choices and wholly emphasizes that it is very possible to do both. Faye is no stranger to racing and completed the United Half-Marathon in 2015 on behalf of Team Horizon (find out more about Safe Horizon here). This was a very special race for her, and it was made more enjoyable by running with dear friends. By the time she got to the finish line, there was a crowd from her team waiting for her, and they celebrated by eating together. Running has always been a part of Faye's life, beginning with basketball, playing tag, or racing around her neighborhood streets. Her first running partner was her father, and the time spent with him are the fonder parts of her childhood. She continued the habit into adulthood, as it just made her feel good. When she's not running longer distances, Faye makes sure that she gets in her sprints at the academy. Martial arts have helped her to be aware of her body and how it works--a conscious effort that requires her to be focused on maneuvering it to attain a specific result. Running comes to her naturally and she is able to be automatic in her movements, with the release of being able to move almost unconsciously and let her body do the work. Faye shares to all runners that they should "Just do it! Even if you don't want to, just do it! You'll feel better once you're done. It doesn't need to be fast or far, just go do it. Planned runs, times runs, spontaneous runs. You choose! Just soak it all in."